Some environmental groups are sitting down with big business. But others say the fate of the planet is non-negotiable. When news broke on Feb. 26 of the deal between Environmental Defense, the 40-year-old, 400,000-member green giant of the environmental community, and the private equity firms bidding to buy Texas energy giant TXU, Jim Marston checked his e-mail. The week before, Marston, an attorney in Environmental Defense's Austin office, had conducted a 17-hour negotiation with executives from TXU's suitors, Kohlberg Kravis Roberts & Co. and Texas Pacific Group, in which he got their commitments to scrap plans to build eight of eleven new coal-fired power plants should they acquire the company. As he went through his inbox, Marston found he was getting attacked from both sides. One friend had sent him a link to a piece from the Wall Street Journal's conservative editorial page excoriating him for what it dubbed a new type of "greenmail" -- using environmental blackmail to force a company to act against the interests of its shareholders and consumers. The Journal argued that pre-deal attacks on TXU from environmental groups had driven down the share price on Wall Street, giving private equity firms a bargain at shareholders' expense. What's more, by restricting the supply of energy, the deal would push up electricity prices for Texas consumers. Another friend had sent Marston a link to an environmentalist blogger who attacked Environmental Defense for cutting a sweetheart deal that left three dirty power plants on the table. "I had to laugh," Marston said. "Either we're extortionists or we're sellouts, but you can't be both simultaneously." In a deal of this magnitude, in which the two sides reached a compromise, such a reaction is to be expected from the true believers on the sidelines. Environmental Defense got the TXU buyers to give up most of the planned coal plants, commit to returning to 1990 carbon-dioxide emissions levels by 2020, and support a $400 million energy efficiency program, including a commitment to wind energy. They also got the company to agree to join the United States Climate Action Partnership (USCAP), the coalition of large energy and manufacturing companies and environmental groups that has endorsed a national "cap and trade" system for greenhouse gasses. This constitutes a major about-face for a company that only a few weeks ago was lobbying against House Speaker Nancy Pelosi's creation of a select committee on climate change. TXU went from being a public enemy of the entire environmental community to a member of the USCAP club, widely seen as the vanguard of corporate America on the climate change issue. 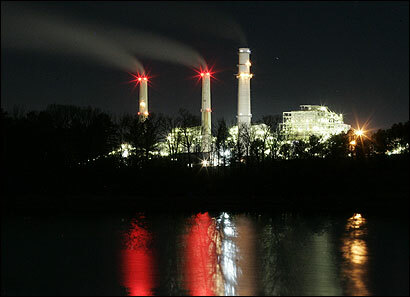 It also ended its costly public relations and legal battle with Environmental Defense over the eight coal plants. But the deal, which Environmental Defense president Fred Krupp hailed as a "watershed moment in America's fight against global warming," still allows TXU to build three new coal plants, including two in Oak Grove, Texas, that will burn infamously dirty Texas lignite coal. Marston says there was little he could do about the remaining three. When the environmental groups fighting TXU split up the work of challenging the plant permits in the courts, Environmental Defense had responsibility for the eight new plants that will now be scrapped, while local groups were given responsibility for the remaining three. The TXU deal is not the first time Environmental Defense has sat down and negotiated with big business. In 1991, for example, it closed a deal with McDonald's to cut down on non-biodegradable waste; in 2003, it worked with FedEx to develop a cleaner fleet of delivery trucks. But by inserting itself into the middle of the roughly $45 billion TXU purchase -- if it goes through it will be the biggest private equity deal ever -- Environmental Defense has flexed its muscles as never before. In the process, however, it may have exposed a rift in the environmental movement. By breaking ranks and cutting their own deal, Environmental Defense's negotiations constituted "an end run around the other groups," says Greenpeace spokesperson Jane Kochersperger. And some environmental groups worry that voluntary agreements with big business are too flimsy, that hard-and-fast legislation is the only way to rein in industries that pollute. In the weeks since the deal was announced, some commentators have presented the TXU deal as a new model of environmentalism, one that effects change not just in the courthouse or state house, but in the boardroom. But as the debate within the environmental community suggests, not everyone has signed on. Some of the criticism of the deal is coming from other large environmental groups, particularly those that take a more confrontational approach than Environmental Defense and its partner in the TXU deal, the Natural Resources Defense Council. "From our perspective, there is no deal to cut," says Chris Miller, Global Warming Campaign director at Greenpeace. "The way to solve global warming is not to split the difference between [eleven] and three coal plants." A moratorium on new coal plants is the only acceptable solution, Miller says. Rather than sitting down with companies and negotiating plant by plant, Miller suggests that environmental groups focus on national legislation to combat greenhouse gasses. "TXU cannot give us the solution to global warming; only Congress and the president can solve this problem." Other groups are willing to see Environmental Defense's approach as a positive part of a broader effort. As Tom "Smitty" Smith of the Texas office of Public Citizen, a corporate watchdog group, put it, "The folks at Environmental Defense caught a 50-yard pass and moved the ball down the field. But we've still got a long way to go to get to the goal line." Marston doesn't feel that negotiating with TXU precludes support for national legislation. He and his group support national global warming legislation of the market-based "cap and trade" variety, but use negotiations with individual companies as part of a two-pronged strategy. With the public finally concerned about global warming and savvy companies realizing that regulation is just a few years away, Environmental Defense sees new leverage for negotiations. Between the carrot of good press and the stick of future regulation, Environmental Defense realizes it has the opportunity to turn foot-dragging companies like TXU into allies. "They believe that federal legislation on global warming is coming soon and if you're going to flourish in a new world of carbon caps, you've got to plan for it," explains Marston. While climate change legislation was a nonstarter with the Bush administration, all the major presidential candidates in both parties are talking about taking action on the issue. But D.C.-based environmental groups aren't the only ones complaining about the TXU deal. Paul Rolke, a rancher and self-described "eco-agitator" with the grass-roots group Our Land Our Lives, lives in the county where two of the three remaining coal plants are going to be built. He's been fighting them since TXU announced its intention to build them a year and a half ago. "The more information we heard about the plants," he says, the more frightened they became. As a local resident, he doesn't have the luxury of only being concerned about the global impact of the plants. For him, the local impact matters most. "Environmental Defense has been very clear that their negotiations were about global warming and global warming only," he says. But from a local perspective, building a dirty new coal plant will have serious public health consequences like childhood asthma and possible mercury contamination. Dallas Mayor Laura Miller, who organized a local coalition of governments and school districts to oppose TXU's coal plants, also condemns the deal. "It's a shame that after all the hard work done by the lawyer representing ranchers in the area, Environmental Defense then blessed the plant," she said, referring to Oak Grove. "They are sending a signal to KKR and TPG that it is okay with them to build the dirtiest types of coal plants that you could build right now. Texas lignite coal is akin to dirt, it's like burning dirt. It's the dirtiest coal available in America." Mayor Miller's coalition acknowledges that Texas, a rapidly growing state, may need new power plants, but sees no reason why cleaner alternatives like coal gasification (a chemical process by which coal is converted to a gas before it is burned), wind, or even nuclear power couldn't be used. It's not surprising TXU's suitors opted to sit down at the table with Environmental Defense rather than "eco-agitators." The group has a reputation for representing what a Wall Street Journal news article referred to as a "business-friendly, market-loving strain of environmentalism." "Why do corporations talk to us?" Marston asks rhetorically. "Because we talk to them. We didn't say, 'go to hell' to the corporations, we said let's solve the problems together." While some allege the private equity groups were just using Environmental Defense to "greenwash" their deal, others say the business and environmental groups simply have more common ground than is often thought. Karl Ulrich, a professor at the Wharton School of Business who studies environmental issues, wrote in an e-mail, "As an environmentalist, I am very pleased to see environmental issues playing a prominent role in market transactions. As a capitalist, I'm also very pleased to see environmental groups working collaboratively with major players in the capital markets...as opposed to focusing solely on regulation." Daniel Esty, a professor with a joint appointment at Yale's law school and forestry school agrees, though he sees the threat of regulation as a prime mover in the deal. Esty said, "Carbon charges will be in place in a few years. I'm confident that the new owners must have done a financial analysis and determined that a noncarbon future was [better] than a carbon future...I don't think KKR and TPG are in the business of being environmental good-deed doers." Even Marston concedes that rather than being a new model for environmental advocacy, these types of negotiations are more a necessary evil at a time when new regulations coming down from Washington are highly unlikely for at least two more years. "If we don't have federal legislation mandating more than what the new TXU is going to do and we don't have that in a few years, we're in a heap of trouble" Marston says. "If we're relying on a few voluntary agreements with a handful of companies, the planet's in trouble." Daniel Brook's first book, "The Trap: Selling Out to Stay Afloat in Winner-Take-All America," will be published in June.